Transport yourself to the pacific northwest by visiting the sea lion sound exhibit! Located in the center of the Zoo near the Penguin Coast Exhibit, this natural habitat-themed display features an 82,000-gallon pool for sea lions. Whether they are basking on rock formations or deep diving in the pool, sea lions are always the center of attention. The exhibit has views from underwater in a lower level area, at water level under a “sea-side” dock structure and above water at the “beach” area, so you can always catch the sea lions in action! These social marine mammals are love visitors and are ready to play! Did you know many of the fish we enjoy are in trouble due to destructive fishing and farming practices. You can help by purchasing seafood caught or farmed in ways that support a healthy ocean – now and for future generations. ASK “Do you sell sustainable seafood?” Let businesses know this is important to you. BUY Best Choices. If unavailable, look for Good Alternatives or the eco-certifies options found on the Seafood Watch app and website. 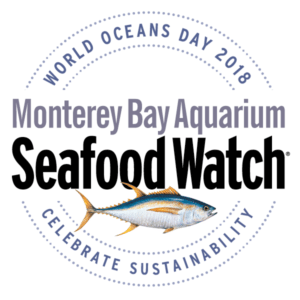 CHOOSE to support Seafood Watch partners when dining and shopping. Download the free Seafood Watch APP to always know the best choices available to you.